Sealing a concrete bird bath that is left outside prevents pitting and disintegration. Unfortunately, many concrete sealers are toxic and may harm birds, so finding a non-toxic sealer is imperative. The project does not take very long, but you will need a whole weekend for ample drying time. 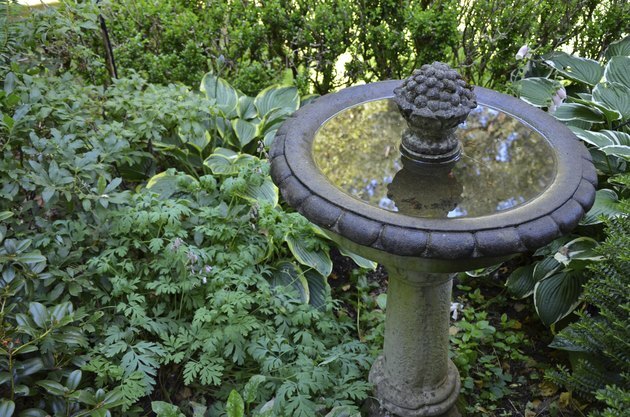 A concrete birdbath filled with water in a garden. Clean the bird bath well with a non-toxic, all-purpose cleaner (such as a citrus cleaner) and a scrub brush. Rinse the bird bath several times with a garden hose to remove all of the cleaner. Allow the bird bath to dry in the sun all day. This will allow all of the water to evaporate out of the concrete so it will be ready for the sealer. Take the bird bath into a covered work space, like a garage, where it will stay dry. If you don't have a suitable indoor work area, wait until the sun dries the dew off the concrete the next day. Paint on a non-toxic sealant. Apply at least two coats to the entire bird bath and allow the sealant to dry for at least 48 hours before filling it with water.